Scanning through the current boxing pound-for-pound rankings, all of the entrants possess an “X factor” – something unique that makes them great. Heavy-handed hitters such as Gennady Golovkin and Errol Spence Jr are rightfully included, while technicians like Vasyl Lomachenko, Terence Crawford and Oleksandr Usyk also justified their places in the list after glittering performances. However, Mikey Garcia is actually the name that stood out the most. Despite not being a knockout artist after moving up in weight classes, nor is he blessed with athleticism or speed, Mikey earned his spot as one of the pound-for-pound fighters with something many aspiring boxers may have overlooked – solid boxing fundamentals. So basic to the human eye, yet there is so much more behind the fighting style devoid of flashiness as demonstrated by the four-division world champion. In boxing gyms, beginners often look up to their more experienced counterparts who display massive power and fast combinations, and hence try to mimic them. However, there are always a few who never capture people’s attention because all they do is practise rudimentary punches, for example, throwing a jab over and over again. Years later, these boxers go on to have successful careers, surprising those who doubted they would go far because they never looked spectacular in training. Mikey Garcia is just like that too. We never see him being showy in training camps, but he gets the job done in the ring. He constantly proves that there is merit in getting the basics right, which can help one go a long way in the competitive world of boxing. Just like what Showtime commentator and analyst Paulie Malignaggi said, Mikey is like a “textbook boxer”. Apart from the abilities to throw sharp punches and maintain a good balance, he is graced with a great sense of timing, allowing him to conserve energy without the need to throw a barrage of punches while still being able to land enough and hurt his opponents. On the defensive end, he is well-schooled with Boxing 101. Both of his hands are always up in position to protect himself, whether against head or body punches. This should resonate with a plethora of boxing trainers who frequently tell their fighters to put their hands up, especially when they get tired in the later rounds. Aside from stamina issues, some boxers employ the stance where their lead hand is low or covering the stomach area, much like Floyd Mayweather’s stance. There is no right or wrong in various boxing stances, but when you do not have Floyd’s reaction time or the required defensive mindfulness, it is better to learn from Mikey by putting both hands up. Eleider Alvarez’s first knockdown against Sergey Kovalev illustrates the ramification of not doing so. All of these combine together to make Mikey a well-rounded fighter no matter which weight class he fights in. Mikey Garcia’s victory over Adrien Broner reveals several points about basic boxing strategies. First of all, Garcia was able to counter off Broner’s body punches. 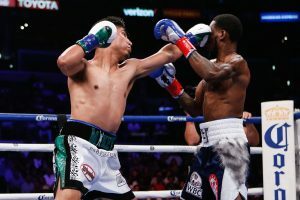 There was an instance where he blocked the American’s attempt to the body with his elbows, then came right up to Broner’s chin with a counter left hook – one of Garcia’s best punches that stunned opponents like Sergey Lipinets. In addition, notice how Garcia always responded to Broner’s offense immediately with his own punches, especially when Broner landed clean on him. A boxer cannot keep defending without retaliating because it adds more confidence to your opponent. In his fights, Garcia has a tendency to mount his own offense which tends to overshadow what his rivals did previously, and therefore swinging the rounds back to his favour as well as sending a stern message in the psychological warfare between the two. On top of his boxing fundamentals, Mikey has a clever method of disrupting an opponent’s rhythm in attack and setting up his own punches. When Broner was forced to the ropes, Mikey tried to unleash short combinations and did land some of them. However, peruse the fight again and you will see that after the punches, he put his left glove in the face of Broner, which looks like a jab, and proceeded to set up his next round of attack. By doing so, Mikey temporarily “blinds” his opponents so they are not in a position to see clearly, and thus are unable to counter him. Similarly, he sometimes ends his combinations in single or double jabs. This reminds us of how Floyd Mayweather Sr likes to work with his fighters on the mitts – ending punch sequences in several jabs. It serves to stop the opponent from reacting instantly and to create distance for moving away safely. These are effective old school techniques smartly applied by the unified champion. Garcia’s showdown against Robert Easter Jr epitomizes how a shorter boxer should fight an opponent with advantageous height and reach. Probing with patience in the first few rounds, Mikey did not lose ground over Easter’s long jab. He either parried them with his gloves or stepped back just enough to avoid them. Gradually, Mikey got in range and landed his accurate “1-2” combinations with perfect form. The jab is straight and sharp, not a so-called “lazy” jab that gets countered; while the right hand is thrown with the intention of punching through the opponent – a key approach of throwing a punch properly. Perhaps the best takeaway is how Mikey extends his punches. A good boxing coach would demonstrate how much of a difference it makes when you simply throw a jab or straight right without moving, compared to taking a small step forward with the jab or turning your body with the straight right. Mikey’s well-timed punches were able to travel further due to the extension such that Easter Jr was not able to fight “tall” with his reach advantage. The final point is about how Garcia consistently brings what he trained in the gym to the actual fights. Some boxers only look good in training camps, but they can’t seem to perform in fight nights. Garcia’s knockdown of Easter Jr is actually a technique he practised repeatedly. He would throw a “1-2” on the trainer-held boxing shield, then after a really short pause, he would throw a left hook. It is not the conventional “1-2-3” punch sequence since the deliberate pause before the left hook is to surprise the opponent who is likely to think that the combination ends with a straight right. Therefore, Garcia’s preparations in camps are highly pragmatic, albeit not fancy at all for the cameras. After unifying the lightweight titles, Mikey Garcia voiced out his desire to do what seems to be a “mission impossible” in boxing – go up twelve pounds to fight the tough and talented Errol Spence Jr. The best part is that he means it. Knowing that the two-year lay-off took away valuable time in his career, he returned with guns blazing. Three out of his past five opponents were undefeated before they fought. As he continues to journey to the peak of boxing, we should applaud and respect his fearless attitude of only wanting to fight the best. And to all the young boxers with big dreams, never overlook the fundamentals, because a small leak will sink a great ship.